Stein Hardeng, Associate Professor of Social Work at Diaconia College, Oslo, and Julie Thorsheim, MSW, of KST Associates in Minnesota, were co-presenters at Augsburg College, Minneapolis, at International Social Work Conference: Global Context: Local Solutions, June 14, 2012. This entry was posted in News on October 28, 2013 by Julie Thorsheim. Congratulations on the Gold Medal from Norway. That is a great honor–-which you deserve. You were a leader of family systems assessment, and it is great to see that Julie Thorsheim is continuing to offer it in the U.S. This entry was posted in News and tagged Kvebaek leader in family systems assessment on March 17, 2011 by Julie Thorsheim. 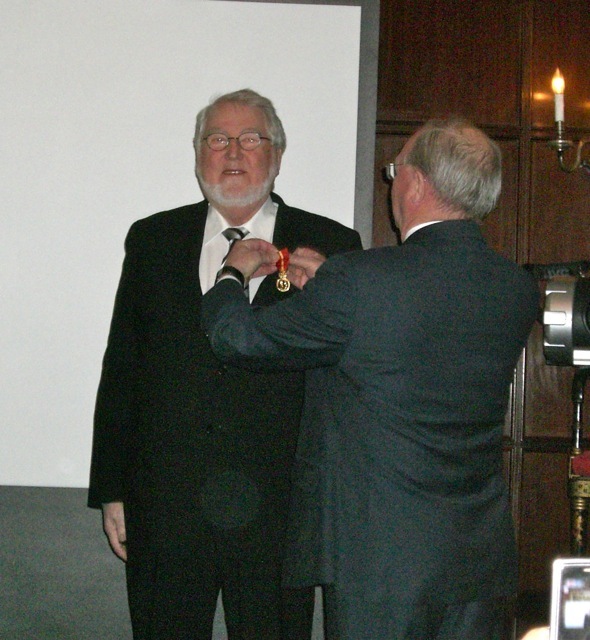 On November 24, 2010, David Kvebæk was awarded the King’s Gold Medal for outstanding lifetime contributions, especially to the field of family therapy. 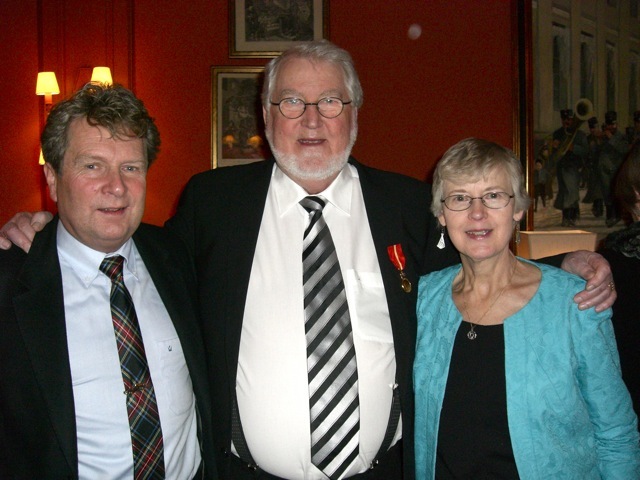 In advance of this ceremony in Oslo, Kvebæk invited Julie Thorsheim to come to Oslo to represent the Kvebaek Sculpture Tool (KST) in the United States. To read the full text of the presentation, click on this link: Gold Medal translation . This entry was posted in News on November 30, 2010 by Julie Thorsheim. 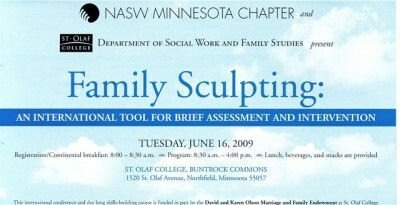 This entry was posted in News and tagged Sculpting: invaluable tool in assessment and family therapy on July 7, 2010 by admin. June 16, 2009 a workshop focused on Family Sculpting took place at St. Olaf College, Northfield, Minnesota. Presenters were: Dr. Anne Hollingworth, psychologist in private practice in Sydney, Australia; Thomas Thorsheim, Ph.D. psychologist in private practice in Greenville, South Carolina; Jean Giebenhain, Ph.D., full professor, University of St. Thomas in St. Paul, MN, and Julie Thorsheim, MSW, of KST Associates. Moderator was Mary Carlson, Chair, Dept. of Social Work and Family Studies at St. Olaf College. This Continuing Education event was co-sponsored by NASW, Minnesota Chapter, and the St. Olaf College Department of Social Work and Family Studies, and was funded in part by the David and Karen Olson Marriage and Family Endowment at St. Olaf College. Hollingworth showed how she uses the Kvebaek Sculpture Tool to incorporate “ the child’s voice” in her reports to Family Court when retained to assess parenting capacity and children’s family attachments for the purpose of making placement decisions about at-risk children. 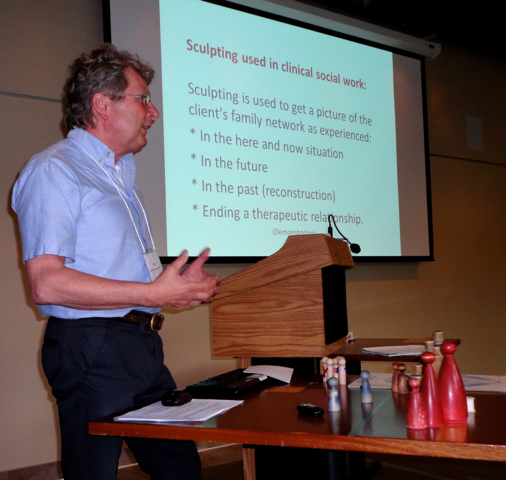 Julie Thorsheim provided historical and theoretical framework of the Kvebæk Family Sculpture and showed participants how to begin incorporating this technique into their practice in a variety of settings. Giebenhain provided insight into the way she uses the KST in research and clinical practice with multi-cultural adoptive families. Thomas Thorsheim provided examples of how he uses this figure placement tool in assessment and therapy with both individuals and families. This skills-building workshop incorporated demonstration, case examples, panel presentation and small group activities to equip participants to use representational family sculpting in their own work. Participants’ evaluations of this full-day experiential workshop were enthusiastic and strong. Look for glimpses of presenters and participants on pages of this website. This entry was posted in Events & Workshops, News on April 7, 2010 by Julie Thorsheim. This entry was posted in News and tagged Rapid insight into family dynamics on September 27, 2008 by Julie Thorsheim. This entry was posted in News and tagged KST to explore child's social environment in South Africa on June 28, 2008 by Julie Thorsheim. Fresh discoveries have a way of renewing our energy. That is what happened about 15 years ago. When a colleague in Norway showed me the Kvebæk Family Sculpture Tool and demonstrated how he uses it, I experienced that excitement of discovery. After conducting a review of the literature and confirming a solid research base for this assessment instrument, I began incorporating family sculpture with my own clients. Using the Kvebæk Tool provides a whole new dimension to assessment and therapeutic intervention! This entry was posted in News and tagged Discovery and renewal on November 12, 2007 by Julie Thorsheim. “I just used the KST with a client and it was profoundly helpful!” This psychologist added that he only wished he’d had the tool available when he first started working with the young man, who is dealing with emancipation issues. This entry was posted in News and tagged KST-"Profoundly helpful!" on November 7, 2007 by Julie Thorsheim. A Family Sculpture Seminar was held in Oslo, Norway, October 5, 2007. Participants — clinicians, consultant, agency administrator, social work supervisor and university professor — shared experiences and research with the Kvebæk Family Sculpture Tool. This core group is beginning plans for an International Conference on Family Sculpture in 2009. Stay tuned! This entry was posted in News and tagged 2007, Family Sculpture seminar held in Oslo, Family Sculpture Seminar held in Oslo October 5 on October 18, 2007 by Julie Thorsheim.